Are You Ready for an Online Genetic Test? Are you prepared to learn the secrets that your DNA holds? 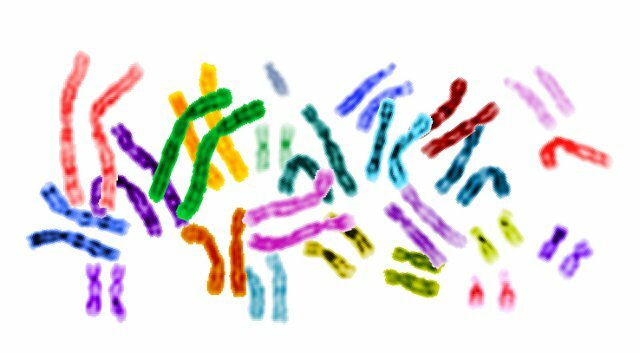 This image of color coded chromosomes is courtesy of Wikimedia Commons. For the right person, an online genetic test can be both fun and useful. But for someone else, it might be overwhelming. Or even worse, reveal things they wish they hadn’t learned. The tricky part is figuring out whether a genetic test that can trace your ancestry, reveal potentially deadly disease risks or even teach you about some of your physical traits is right for you. Probably the best way to find out is by talking to a genetic counselor. They’ve thought through (and probably seen) all of the side effects of a genetic test. But most people don’t do this. Lots of people don’t even know about genetic counselors. The ones that do may not want to be bothered or even realize such a talk might be helpful. If you don’t have an inkling already about some of the pitfalls of a genetic test, why would you seek out counseling? Another way that might help people decide if one of these tests is right for them would be to let them know what some of the unintended consequences of a genetic test might be. This is what we have tried to do with a set of animations we recently put up on our website. These short (less than two minute) animations are in no way exhaustive but they can give you a feel for a few of the potential pitfalls. Now in this case Tina’s friend’s results didn’t give any evidence either way about whether her dad was her biological dad (she’d need his results to confirm that). Still, the results were confusing enough that she needed reassurance from Tina. And just because in this case the test didn’t show her relationship to her father, that doesn’t mean that these tests can’t sometimes reveal a dad who isn’t biologically related to his child. They can and they do. In fact, given that around 2% of men are in this situation, more and more people are going to find out their dad isn’t related to them (or that a sister is actually a half-sister and so on) as more and more people get tested. If Tina gets a positive result, should she tell her sister? If she does, then her sister will learn that she almost certainly has a 50% chance of having it as well. What if she didn’t want to know? Now we see the sisters dealing with survivor guilt, anger and who knows what else. Luckily they had a genetic counselor to help them deal with these issues. Not everyone who takes an online test will. We also deal with a couple of other situations too. In one scenario, Tina is trying to decide whether to get an online test to see if she is a carrier for the genetic disease cystic fibrosis. And in the other Tina is trying to decide whether or not to get a genetic test for Alzheimer’s disease. Neither decision is as easy as you think. Don’t get the wrong idea, none of these are designed to say online genetic tests are bad and you shouldn’t take them. They can help you make informed choices like Angelina Jolie did recently when she tested positive for a DNA difference in her BRCA1 gene that significantly increased her risks for breast cancer. We wanted to make these videos so people could be introduced to a few of the potential pitfalls of these sorts of tests and so can make a better informed decision. For example, I thought through these possibilities and none of them stopped me! I took a 23andMe test a few years back and couldn’t be happier. It was so cool to see the instructions for me written in the genetic code. The test also provided a huge amount of information about what my genes can tell me about my future disease risk. This is where someone who worries a lot might get very freaked out. Lots of diseases, lots of potential risk. Since I have a background in genetics, I know to take most of this health risk data with a huge grain of salt. As a recent study showed, depending on the studies a company decides to include and the algorithm it uses to predict risk, you can end up with very different risks. Sometimes one company will say you are at an increased risk for a disease while another says you are a decreased risk. So now it is up to you. Do you still want to take that online genetic test? After thinking it all through, I did.